…Especially when it comes to the different types of plastics used to make foodservice products from tongs, to food pans, to sugar caddies. Different types of plastics are better suited for certain products than others. The chart below is a great breakdown of this point. 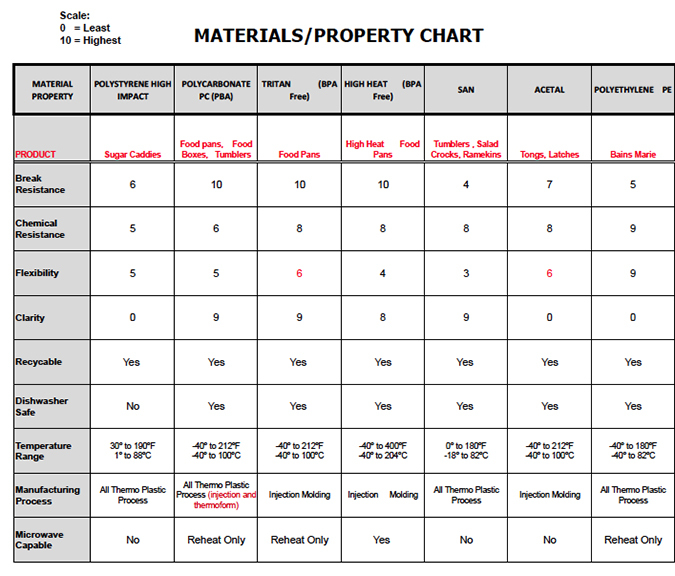 Click here for the full PDF of the chart below. The characteristics of the type of plastics determine what products are made from it. For example, High Heat (BPA Free), is the only plastic in this chart safe for use above 275°F. So it’s used to make food pans that are often used to cook, store and reheat food, and it’s fully microwave-safe. It’s also important to note that there are two different types of Polypropylene. The first is PPY HOMO Copolymer. This plastic is relatively frail and not see-through at all, however it is very chemical-resistant and flexible. It’s great for café trays and Bain Maries. The other type of Polypropylene is LD, HD, Impact Copolymer. This version is twice as strong as the other and can exhibit significantly more clarity. These characteristics make it better for trashcans, food-pan lids and different styles of racks. Two different plastics can be used for making tumblers. Both SAN and Polycarbonate PC share similar qualities that make them appropriate to use for plastic drinkware. However, the biggest difference is that Polycarbonate is significantly stronger. So although they’re the same end product, the different plastics can determine the durability of the product and ultimately its price point. – Melamine and Fiberglass are the only plastics that are NOT recyclable. – Polycarbonate, Tritan and High Heat are the strongest plastics. Next time you’re working with products made from plastic take note of what type of plastic they’re made from. The material will give you a great idea of the products strengths, weaknesses and proper use.